Made-to-Order Sputtering - Furuya Metal Americas Inc.
We provide made-to-order sputtering service for Magnetic Recording, Touch Panels, Non-volatile semiconductor memory, electronic devices and electric components. We are able to provide various types of PGM targets. *We are flexible to sputter materials that are not on our target list. Please contact us for more information. We can form films on large substrates such as Φ300Si wafers and glass for FPD. In addition to offering made-to-order thin film, we also offer patterning. 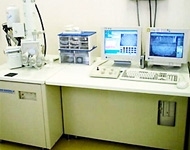 According to customer need, we also provide thin film analysis.